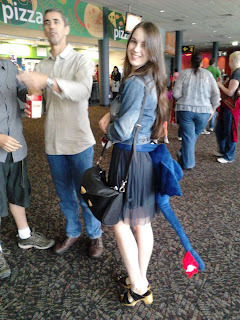 My Family and i last weekend went to the How to train you Dragon arena spectacular (was epic) And i thought i would pass on my experience. Wow just relized how long my hair is. wonder how it looks if i don't plait it after washing ??? When we got into the stadium they had a projection of the dreamworks logo, (the kid on the moon fishing) these projections were almost the star of the show. They worked in beautifully with the choreography and in one scene in particular left you wondering were the best of the action was. They were not only the scenery but were used to hide several things until they needed to be seen. The production was started with a funny little speech telling us the flash photography hurts the dragons eye's and since we are traveling to the past there will be no mobile reception so please turn your phones off (they will be useless). It was beautifully delivered. But the dragons. These were truly the stars of the show. First off. Most of them were absolutely massive. I am not kidding. The first one you see is 2/3 of a tennis court. and he wasn't even the biggest. They were so life like in the way they moved. And Toothless. Omg Toothless. The emotion on his face was so real. even though they couldn't do it like the movie, it was so close it didn't matter. The overall movement was a bit lethargic, with slow and long flight scenes, which may be a bit tedious for little kids. But i was sitting there in absolute awe of these mechatronic beast that i nearly forgot there was a story going on. The story line pretty much follows that of the movie. They had to change some things so that they translated better for onstage, but it was even more gobsmacking like that. For example, instead of a book of Dragons, they had a story teller with shadow puppets, and these puppets were massive and pretty to look at whether you looked at the projection or the shadow puppets themselves. Speaking of Puppets there were several dragons that were human driven puppets. You need to look them up because there hard to explain but they were good fun to watch. All in all this was a fantastic spectacle. The story was a bit slow in some spots but you could easily distract yourself but loosing yourself in the make of these dragons or use of the setting. I wouldn't recommend it for really young children because some of these dragons are massive, and pretty scary. One of them blew fire while flying and they had budgie burners on the sides that did the job for them if they couldn't. I would say 6,7+ unless they get scared easily in those few parts. All in all it's a comedy and the humour is good. If your older and have seen the movie then i will say the movie is better. But for me it was just a joy to see the spectacle in real life. Check it out it's lots of fun, and perfect for a day out.